Alexandra & Grampa Joe Clark, originally uploaded by johnwmacdonald. 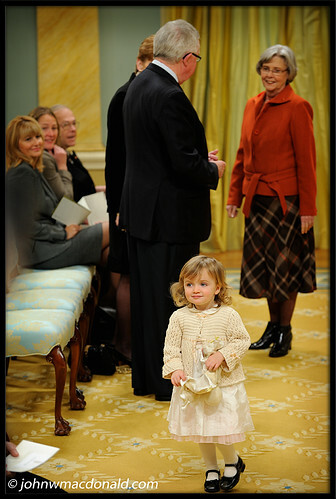 The Right Honourable Joe Clark's granddaughter, Alexandra, takes a stroll in the Rideau Hall ballroom prior to her grandmother's (Maureen McTeer) award ceremony. Needless to say, the lovely two-and-a-half-year-old stole the show. OTTAWA—Her Excellency the Right Honourable Michaëlle Jean, Governor General of Canada, will present the Governor General’s Awards in Commemoration of the Persons Case to six laureates during a ceremony to be held at Rideau Hall, on Friday, November 7, 2008, at 10 a.m.
Edward Schreyer, the awards were instituted by the Government of Canada in 1979 to honour the 50th anniversary of the Persons Case and the five Alberta women whose determination led to a landmark victory in the struggle of Canadian women for equality. For additional information about the Persons Case award or the laureates, please visit the Status Women Canada Web site at www.swc-cfc.gc.ca.